Elon Musk is Going to Build a Vast Network of Deep Underground Bases and Tunnels. Deep Underground Bases and Tunnels have been the subject of much research and skepticism over the years. An interesting subject that can fascinate even a casual fan of science and technology. Many have read about the possibility that Deep Underground Bases and Tunnels may already exist and are in use by the U.S. government. Stretching across the country thousands of miles connecting key underground facilities. Using exotic boring machines and transport systems not being shown to the public. Some of this research is very compelling. Definitive evidence is hard to come by. Still interesting clues pop up once in a while. Already you can feel the “tin foil hat meter” edging up. Who would seriously believe any of this was even possible? Crinkle up a tin foil hat for billionaire entrepreneur Elon Musk. He gave a revealing interview to Bloomberg Business Week about plans for his Super Sonic Tunnel Transport System called Hyperloop. Exactly the same type of Deep Underground Transport System rumored to have been is use by the U.S. government for years. There is nothing boring about the history, possibility and urban legend of secret Deep Underground Bases and Tunnels. 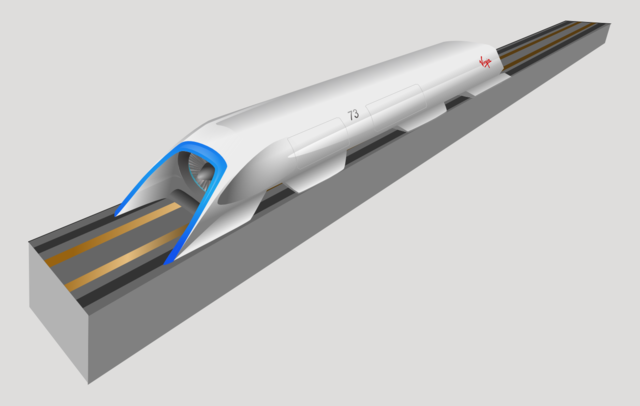 The Hyperloop design very similar to magnetic levitation transport systems and vacuum tunnel designs proposed in the 1970’s by the Rand Corporation. Able to travel 1000 miles per hour across the country from one deep underground base to the next. Rumored to have been in operation for years. Now here it is. No tin foil hat is required. I wrote an article giving a complete breakdown of these striking similarities on February 8, 2017. It is the intention of this article to follow up on that very detailed report. My report asked if all of Musk’s cryptic Tweets about tunnels being built at Space X’s L.A. headquarters had something to do with taking the HyperLoop system underground. Inferring any scaled up HyperLoop system would need advanced tunneling methods and look very similar to the original designs. Done by Robert M. Salter a lead scientist with the Rand Corporation that wrote the Very High Speed Transit System in 1972 and “Trans Planetary Subway Systems: A Burgeoning Capability in 1978. The original SpaceX concept paper indicates that HyperLoop was heavily based on these Rand Corporation designs. Exactly the design some believe the military and government have been using for years. A deep underground tube transport system able to go 1000 miles an hour. The same one that couldn’t possibly exist. Cited in the Hyperloop concept paper is Rand Corporation’s work. The question was asked if the tunnel being built underneath the SpaceX parking lot had anything to do with HyperLoop system. The HyperLoop was originally proposed as an above ground transport. SpaceX has an above gound mile long vacuum tunnel on it’s grounds. Testing prototypes of the design with it’s HyperLoop competition. Musk’s tunnel project was being presented as a way to relieve traffic hassle for the employees at the time. Deepening the mystery was if this excavation was going to be used for the HyperLoop at all. SpaceX was being very quiet about the whole thing. Indeed some questions were answered in the Bloomberg Business News article on February 16, 2017. Wondering aloud in my last post on this subject if advanced tunneling techniques would some day be used on a scaled up project? That question was answered as well in the Bloomberg piece. The demo-tunnel being built now is using a conventional boring machine. Musk admits it is only a test bed for more advanced techniques and the beginning of a vast underground network. The exact building methods said to be used in construction of Deep Underground Bases and Tunnels. Multilevel complexes connected by networks of tunnels. Patents exist for advanced boring machines. According to the patents if these boring machines were built they could melt through any type Earth forming molten rock. That molten rock is then forced along the side of the boring machine and cooled using heat exchangers. Forming it as the tunnel face and supports. Leaving behind a casted smooth glass like surface of solid rock with no need further reinforcing. Completely sealed and waterproof. Perfect for the tunnels and base complexes needed for the HyperLoop system. These boring machines would be capable tunneling thousands of miles and making multilevel three dimensional structures underground. Just as Musk is proposing. Creating turn key Deep Underground Bases and Deep Underwater Bases that are hermetically sealed and have virtually no limit on how many levels deep they can go. Basic Layout of a Deep Underground Base using only one advanced boring machine. Connected to transport system creating a sealed facility ready for interior construction. As many as thirty levels down according to Musk. Circles formed by the boring machine create each level. A vertical shaft is bored to the next level where another circle in formed and so on. Going ever deeper into the Earth connected by vertical shafts. Once the last level is done a vertical shaft is made all the way up allowing the boring machine to exit. Creating another tunnel to the next project and so on. The Patents for these boring machines exist. Will these boring machines who’s patents are held by the Department of Energy be pulled into use for the HyperLoop? Why are these ideas considered far out technologies that can’t possibly exist? Even though there is very compelling evidence. Until someone rich and famous says they are possible and is doing it. The idea is main lined very softly at first. Always couched in boring terms or presented as fun and convenient. Musk is an undeniable genius who has had more than a little help from the U.S. government with all of his companies. Both financial and technical. Launch pads and engineers transferred from Cape Canaveral to SpaceX along with huge contracts with NASA. Low interest government guaranteed loans for Tesla Motors and SunCity. A long track record of privatizing government technology with government money. It would not be that far fetched to venture that the U.S. government may provide technical and financial help if the HyperLoop project were ever scaled up. No criticism of Musk. Someone has to be the frontman on older Black Budget technology if the public is ever to get any good out of them in the civilian market. He is only playing the handful of aces somehow dealt to him to accomplish his goals. To be a fan of science and technology is to be a fan of Elon Musk’s work. Almost all technologies are first developed and deployed by the military. Having a second market in the civilian sector years later. This is the pattern with almost every modern technology such the internet, satellite telecommunications, computers and cell phones as well thousands of other examples. Why would it be any different in this situation? Nothing is boring about advanced technology kept in secret for years finally being revealed.